Present Illness: Patient #1 is a 59-year old right-handed white male, self-referred, with a history of progressive numbness in his lower extremities beginning in the early 1980's, as well as increasing horizontal diplopia beginning in 1991. The patient himself was a vague historian. He claims to have noticed joint discomfort in early 1980 which was diagnosed as "arthritis" and prompted therapy with low dose prednisone. Beginning in 1981 he complained of numbness in and around his upper and lower lip, as well as in his lower extremities. The numbness in the legs gradually increased up to his mid-thighs and to a lesser extent involved his hands. In the mid-1980's the patient had complaints of inability to maintain an erection. He was thought by his physician to have possible autonomic dysfunction. Beginning in 1990 the patient developed mild leg weakness and had balance problems, "walking like a drunk person". He denied any pain. In 1991, while on vacation, he developed the acute onset of horizontal diplopia which was more marked on looking to the left, but was present to a lesser extent when looking to the right. He also complained of decreased vision in the right eye. All of these problems have continued to progress to the present time. Past Medical History: In 1981, the patient underwent nephrectomy for cancer of the left kidney. He had surgical correction of left ptosis on three separate occasions (1989-1990) and a penile prosthesis implanted in 1994. He gave a history of hypertension for over 40 years treated with antihypertensive medications. Medications: Calan (verapamil), prednisone 5 mg every other day, lozol (indapamide), and aspirin p.r.n. Physical examination was within normal limits with no evidence of cardiopulmonary abnormalities, organomegaly, or arthropathy. He had no postural hypotension. Mental Status: The patient was awake, alert, and pleasant with a mini-mental exam of 26/30, disoriented as to the day, with difficulty performing serial 7's and spelling "world" backwards. Cranial Nerves: He was noted to have mild bilateral ptosis, left greater than right with no fatigue on upward gaze and mild lid retraction in downgaze on the left. Visual Acuity: OD 20/100; OS 20/20. Fundus: Retinal disciform scar right macula-no papilledema. Corneal Reflex: Absent in the left eye. 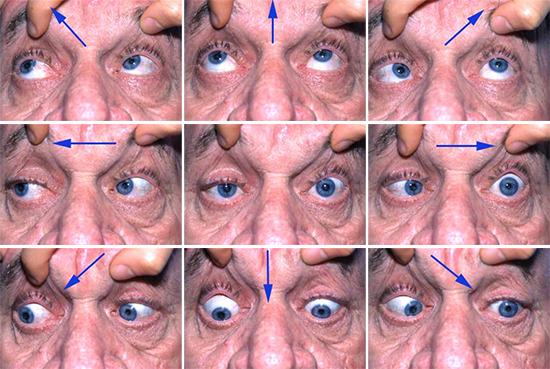 Extraocular Movements: The patient is asked to look in the various positions of gaze, as indicated by the arrows. 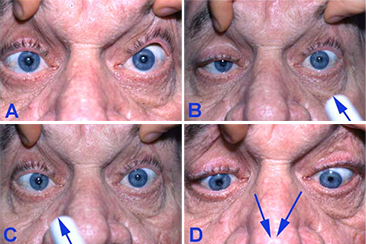 Pupillary Response to Light and On Convergence: A) Straight ahead gaze; B) Light reaction of the left eye; C) Light reaction of the right eye; D) Convergence effort. Motor: There was normal bulk and tone in upper and lower extremities with a slight pronator drift. Slight (4+/5) weakness in the deltoids in the upper extremities and iliopsoas in the lower extremities with remaining strength intact with the exception of wrist and finger extension being 4/5 and knee extension and flexion being 4/5. Reflexes: Absent in upper and lower extremities and both plantar responses were downgoing. Sensation: There was significant impairment of position sense bilaterally in the upper extremities to the elbow and in the lower extremities up to and including the knees. He had slight diminution to pinprick, light touch, and temperature in a glove-and-stocking distribution. Vibration was markedly decreased in the lower extremities below the knees. Cerebellar: Normal on finger-nose-finger and heel-to-shin with no dysmetria or dysdiadochokinesia. Gait: The patient had a slow, wide-based gait, was unable to walk on heels or toes, and could not perform tandem gait. He had a positive Romberg test.